It all started three years ago when we took a leap of faith. It was one of those moments when you knew your parents would not have approved, but you were going to do it anyway. Except that we were in our late 60s, and our leap was out of a cohousing community and into a duplex farmhouse in need of renovation on a nine acre farm, to live with a young family with two small children. 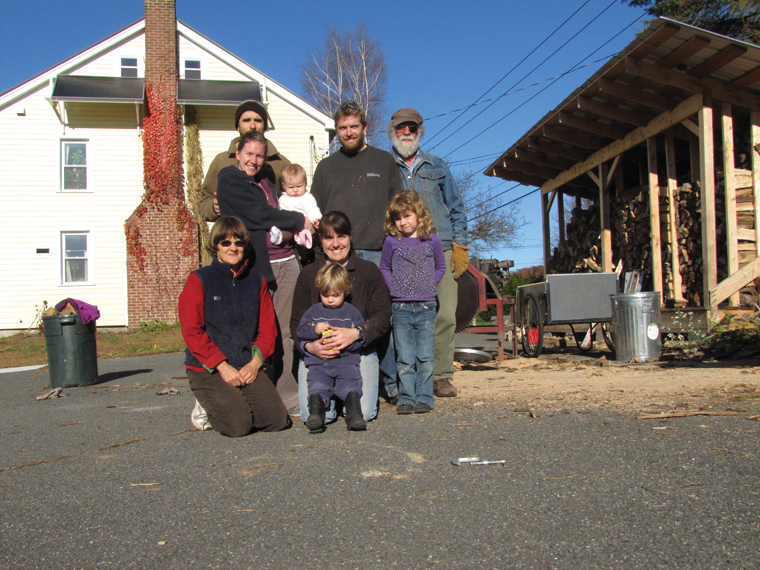 My husband Michael and I were living in Pioneer Valley Cohousing Community in Amherst, Massachusetts with 31 other families. I was a founding member, deeply entrenched in the community. We were pretty happy with our situation there. I thought I was at the culmination of a life in search of community and had finally found one where I could live out the rest of my days. I was born into a Quaker family, went to a Quaker school that was a cooperative farm, lived in cooperative houses most of my adult life, and worked in a consensus-run nonprofit organization. The balance of public and private in cohousing seemed ideal: I could be part of a healthy community and have my own private (read clean) kitchen. I believed (and still do believe) that consensus decision-making is an elegant, inclusive, and powerful way for human beings to relate to each other. Then a young pregnant couple with a small child moved into the unit across the path as temporary renters, considering membership. We became fast friends as we discovered how much we had in common in spite of being of different generations. We had the kind of personalities that work together well, and we enjoyed each other’s company. We respected each other’s skills, which were many. We all valued simplicity, good work, and living as lightly as possible. We all wanted to grow as much of our own food as we could and find local sources for the rest, and to raise animals for meat and milk. They wanted to raise their children to be connected to the land and to where their food comes from. Because of my relationship with this new family, I began to be aware of what I was missing at Pioneer Valley: close connections based on deep common values and common purpose, and I wanted a farm. It gradually became clear that Pioneer Valley Cohousing was not the place to begin. There was not enough land for all of the uses the community had in mind, and there was considerable resistance to farming and farm animals. It wasn’t easy to do. I was still attached to the idea of cohousing, and a little afraid to leave such a safe environment on the cusp of my old age. At some point I realized that to be in a small close community with people who love me was much safer than the idea that “someone” in cohousing would step in if I needed help. We talked about starting a new, smaller cohousing community, but abandoned the idea because of the time it would take, and the difficulty of finding other members. We decided to look for land with living space for both families. A two-family house with nine acres and two barns came on the market, and without looking back, we leaped off into the unknown. 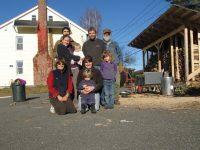 We spent six months doing a deep energy retrofit, creating an energy efficient house from scratch out of a series of sheds in the rear for the other family, remodeling and insulating the large old colonial front house for us. We set aside rooms that would always be owned in common: a large pantry on the first floor between the two kitchens and a guest room on the second floor and a common front porch. During the entire renovation, we never had an argument. Plenty of decisions, some disagreements, but all peaceful. It still felt totally right. We moved in in June of 2012 with great ideas. A permaculture farm, with gardens, goats, chickens, meat chickens, turkeys, pigs, a pond, hedgerows, rainwater system, compost system, sugarbush. We designated an area around three sides to go wild and provide habitat for local flora and fauna. We started small with chickens, a small garden, a hedgerow, and the beginnings of an orchard, and gradually expanded to include two hoop houses for season extension, a small herd of goats, more gardens, and lots of projects in the planning stages. We were hoping for another family to join us, but knew that they had to be kindred spirits, not just people wanting to farm. A year and a half into our adventure, another young couple, friends of our farm-mates, bought a little house right across the road from us and joined us as equal partners in the farm. We became a community of six adults and three children, now ranging in age from two to 71. We made conscious effort to integrate the new family, since they were coming in after we had established ourselves, and their house was not connected the way our houses were. We wanted to be sure that we broke down any barriers before they arose. It is still more difficult to include them, since so many conversations happen naturally at random times during the day as we wander in and out of each other’s houses, but we have regular farm meetings after dinner once a week to make sure to catch each other up on our lives and farm business. We all share the work of the farm, but each of us has an area we are most drawn to and know most about. I am a longtime gardener; Seth devises systems, builds and fixes things, and loves the goats. Jason knows all about engines, and loves the garden as much as the animals. Jess is my garden buddy. Bethany manages the orchard. Michael is the grease that makes it all flow smoothly by running errands and helping with any manual labor that needs doing. The children, being very social creatures, love to help out and are learning real-world skills. Since many of our projects are new to us, we are constantly searching out information and skills and we research in our area of expertise and then share it. We have work days, usually a half day, when we all work together on some project. Recently we reroofed a portion of one of the barns in preparation for solar panels. We have work days to plant the garden and to prepare it for winter, to tend the orchard, to get in the hay. We struggle, however, with getting it all done, as you might imagine. Four of us have full-time jobs, but two are teachers and have the summer off. Michael and I are retired, and have lots of time, but limited energy. We are all constantly excited about starting new projects and have to rein ourselves in with practical considerations. We don’t sell our produce, but hope only to feed ourselves as sustainably as possible. We are not aiming for self-sufficiency. We believe that sustainability can’t be achieved without the wider community. We are cultivating interconnections, first among our three generations, then outward to neighboring farms, farms in our watershed, and to local and regional businesses. Barter and sharing labor are an integral part of our philosophy: we share, lend, and trade with several nearby farms for manure, seeds, tools, equipment, labor, and produce that we don’t grow. We participate in Valley Time Trade (a local labor/barter system). A neighbor pastured his geese and ducks on our land, fertilizing our pasture, and gave us some meat in return, and two geese to guard our chickens. We traded two oil tanks left from the renovation for manure from the horse farm nearby, spread by a neighbor with access to a manure spreader. We save and share seeds. We hope to create a web of interconnections that will be resilient in what may be difficult times to come. Our finances are separate, but we have a farm account that we all contribute to every month, which pays for the things that we buy in common: fencing, animal feed, tools and hardware, fuel for the tractor and mowers, supplies of various kinds. Bulk food we pay for as we go, splitting the cost. We transformed the ownership of the duplex house from co-ownership to condominium ownership, in a nod to the fact that one or the other (probably us) will one day leave and need to sell. Jess and Jason own the house across the street, and we are working to find some legal arrangement that recognizes their commitment to the farm. The door between the houses in the duplex is always open, unless there is a specific reason. We eat dinner together almost every night, unless one family needs solo family time, or someone has guests and wants quiet dinner conversation. There is no meals schedule, no payment for meals; generally someone will come up with an idea for dinner, and tell the rest by email in the morning and serve it up at night. Often others will contribute some side dish to the meal. The cost of food evens out over time, especially since we grow most of our food and buy together in bulk what we can’t produce. My husband and I have the largest dining table, and the biggest space, so dinners usually happen in our house, the downstairs of which functions somewhat like a common house in cohousing—everyone is free to walk in any time. I come home sometimes to cheery small voices greeting me from my living room. When I get up in the morning, small footsteps run through the pantry that connects the houses and it is Case, five years old, with his cheerful and charming smile come to see if I am ready to play. Alina, seven, had a little desk in my study for art projects, until she outgrew it. Alina and Lyla, who is now two, have a big/little sister relationship that is very sweet to see. I asked Alina what was the best thing about being a kid here. She replied that because we are on a farm, there is always something good to do, and sometimes kids can do things that grownups can’t do, like milk the goat with little teats. The kids are learning all about food, and are acquiring a sense of place that is rare in the world. They are seeing adults collaborate and work through problems. They have a chance to learn to use tools and be part of a working team, and to develop confidence and strength. I also asked Alina what makes the farm work. She said (not in these words) that we know each other very well, we generously share things without feeling territorial, we don’t keep score, we all work together as a team, and we talk to each other about important things at dinner. She’s right. Since we are a small community we can get to know each other in depth. We all believe that community rests on generosity, communication, and openness. Because we are so small, and know each other so well, accountability is built in—there is no anonymity. If we agree on a decision, it is because everyone has thought about it, talked about it, and genuinely agrees to uphold it. If we need to change our minds and do something different, we can easily do that. We have no disgruntled minority. We give each other the benefit of the doubt, knowing that we are all doing the best we can because we are all committed to our adventure. Since our farm mates are younger than our children, it might have been easy to treat them like children and to be constantly aware of the age differences, and for them to see us as parent figures. But somehow we don’t think of them as anything but farm mates, with their own unique skills and personalities. They don’t see us as parents, but respect us instead on our own merits. To the children we are essentially surrogate grandparents, and when the real grandparents come, we take a back seat. Our struggles center around communication—with three small children and four jobs, it is difficult to find time to talk over all of the things that we need to, both farm business and interpersonal issues when they arise. For the same reason, the time line of many projects is not what we hoped, and that sometimes causes tension. Our priorities are not always the same. Why are you cleaning the barn when the tomatoes need to be staked? Should we get pigs or meat chickens next year, or just do a better job with what we are already doing? What can we realistically expect to be able to do? We also struggle with the finer points of some of our values and with our attitudes toward money: a riding mower would enable us to spend less time mowing and more time growing, but it uses fossil fuels and emits pollution. Is it better to hay early for the sake of the health of the hayfield, or do we wait until the ground-nesting birds are gone? When there is not enough time, what is it ok to let go? Do we buy what we need, or try first to make or borrow it? How strictly do we try to vote with our money? Do we buy it from the big box store because it is cheaper and available sooner, or support the local hardware store no matter what? We do manage to navigate these more perilous waters with the spirit of community as our guide. Our relationships and connections with each other are more important than our differences of opinion. We would rather have a happy community than be right. We find solutions to our problems that work for everyone because if we win only individually, we lose as a community. We were incredibly lucky to find the right people and the right land, at a time in our lives when we could take advantage of the opportunity. I think it would be very difficult to set out to create something similar with only the idea and the desire. But what is possible is what I did: Take time to find and build your community. Nurture your connections. When you find it, don’t let it get away; leap into it and give it your whole heart. I wake up in the morning to the sun streaming in the east window, making the hallway glow. I hear Seth’s and Jason’s voices in the barn, and the soft bleating of the goats. I hear children’s laughter downstairs; I smell coffee and hear the rattling of dishes as someone enters our kitchen to put last night’s supper dishes away. I am filled with gratitude every day, and I have only one question: What do you do when you have everything you’ve always wanted? Rebecca Reid is a grandmother, a farmer, and a photographer who thinks that community is the answer, and has been trying to prove it for years. She lives in Leverett, Massachusetts with her chosen family, and is very happy.